Visual MODFLOW Flex supports the Horizontal Flow Barrier (HFB) Package included with MODFLOW. 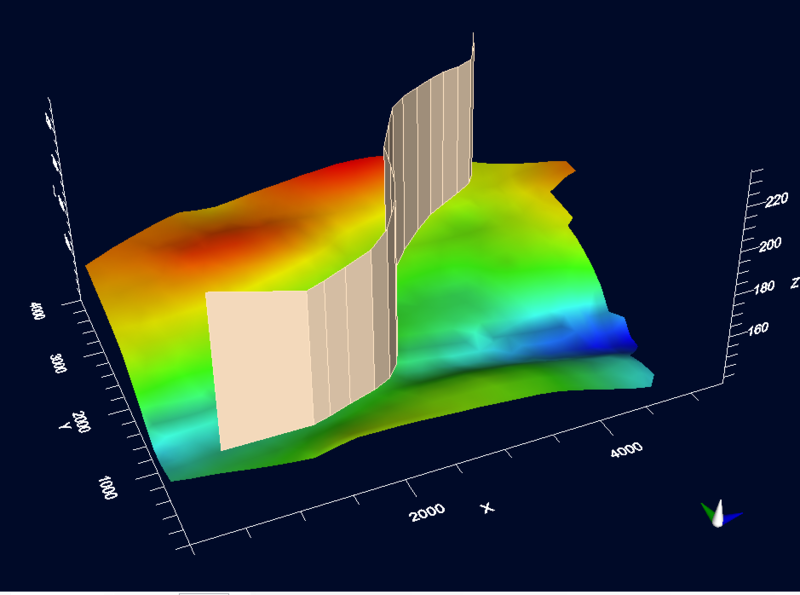 The Horizontal-Flow-Barrier (HFB) Package, or Wall Boundary as it is referred to in Visual MODFLOW Flex, was developed to simulate thin, vertical, low-permeability features that impede the horizontal flow of groundwater. This package allows such features to be simulated without the need to reduce grid spacing in an excessive number of model cells, thus enhancing model efficiency. These features are approximated as a series of horizontal flow barriers conceptually situated on the boundaries between adjacent cells in the finite difference grid. The key assumption underlying the HFB Package is that the thickness of a barrier is negligibly small in comparison to the horizontal dimensions of the cells in the grid. 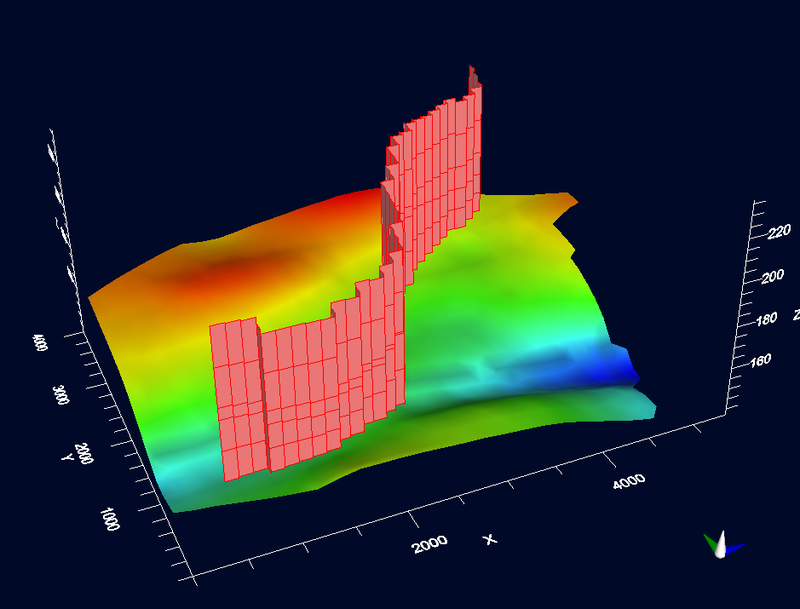 Barrier width is not explicitly considered in the Package, but is represented in MODFLOW as a hydraulic characteristic defined as barrier hydraulic conductivity divided by barrier thickness. •(I1, J1): Row and column number of grid cell on one side of the barrier. •(I2, J2): Row and column number of grid cell on the other side of the barrier. •Hydchr: Hydraulic characteristic of the barrier (equivalent to hydraulic conductivity of the barrier divided by the width of the barrier). Wall Boundaries are currently not supported for MODFLOW-USG or MODFLOW-LGR numerical models, or MODFLOW-2000/2005 grids using a Uniform or Semi-Uniform vertical layering approach. Walls can be defined in the Conceptual Model workflow, or in existing numerical models using structured grids (excluding MODFLOW-LGR). The behaviour for Walls is similar to other boundary conditions in Visual MODFLOW Flex; if you create this object in the Conceptual Model workflow, then the numerical realization of the Wall will be created after you run "Convert to Numerical Model" steps. If you "Assign" a wall in a numerical model, then Visual MODFLOW Flex will create the conceptual object and also create the numerical wall representation at the same time. In Visual MODFLOW Flex, Wall objects are assembled using existing data objects in the Data tree and from Conceptual Model. Horizontal Flow Barriers (or Walls) are assigned by using polyline objects to define the spatial extent, and Horizons to define the upper and lower extents. 2.Import the desired polyline object, or digitize the desired polyline using the 2D Viewer (see Creating New Data Objects for more details). Note: the polyline data object must contain only one line feature. 5.In the Model Explorer, expand the Model Explorer tree, then expand Structure / Horizons to see a list of Horizons. Conductivity: The hydraulic conductivity of the barrier wall. Thickness: The thickness of the barrier wall. 10.Click OK when you are finished. 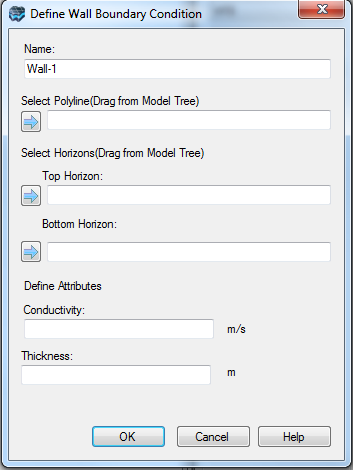 The Wall object will appear on the Model explorer, under the Conceptual Model / Boundary Conditions folder. If you created the Wall from within a numerical model workflow, then you will also see an item "Wall". If you created the Wall in the Conceptual Model, then the Wall numerical boundary condition will only show up after you complete the Conceptual to Numerical Model Conversion. Visual MODFLOW Flex will automatically calculated the appropriate cell faces based on the intersection point of the polyline and spanning through the appropriate model layers. You can edit the attributes for a Conceptual Model Wall object by right-clicking on this item in the Model Explorer, and selecting "Edit Boundary Condition". Please note that if you change the attributes, you need to re-run the Conceptual Model to Numerical Model conversion in order to re-generate the numerical model Wall object(s). You can edit the attributes for a Numerical Model Wall object by right-clicking on this item in the Model Explorer, and selecting "Edit Attributes...". The attributes will load as a CSV file in either Excel or Notepad (or other text editors if you have associated a different program to .CSV file extensions). Make the desired changes to the values, then close (and Save) the file. When you are finished, and wish to update the Wall object with your edits, right-clicking on this item in the Model Explorer, and selecting "Reload Attributes..."